In the 60s, Brazil went through a period of great cultural effervescence, in which music played a pivotal role. Many TV programs hosted by musicians – all on the same TV station, São Paulo’s TV Record – arose in the second half of the decade. Before TV soap opera actors, it was musicians and singers that were the great TV stars. It was during this period of optimism in Brazilian Popular Music (MPB) that TV Record created the great Festivals of Brazilian Popular Music. On them, countless new talents were able to present their latest creations and enter the highly competitive musical scene. These festivals made their mark on the history of Brazilian music by the commotion they instigated, the discussions they provoked, by the space they represented in the middle of a dictatorship, and, significantly, because it was from these spaces that the Tropicalist movement was able to erupt in all its audacity. Some festivals were especially notable, like the third festival on TV Record, in October, 1967. Daring to defy the “good taste” of the predominant Brazilian music of the time – acoustic instruments and lyrics that showed left-leaning politics – Caetano Veloso and Gilberto Gil added elements of rock-and-roll to their songs, taboo at the time and detested by many, if not almost all. Caetano sang his song “Alegria, alegria” (“Joy, joy”) – a pop “marchinha” (a type of Carnival dance) whose kaleidoscopic lyrics portrayed fragments of urban reality – backed by an Argentinean rock band, the Beat Boys. The expected boos ended up being drowned by enthusiastic applause. Gil also innovated in the presentation of his song “Domingo no parque” (“Sunday in the park”), backed by young Paulista rockers, the Mutantes. The big novelty in this song was the cinematically conceived arrangement by Gil and Rogério Duprat. With the presentation of these songs, booed and yet hotly debated, the road map of where Tropicália would ultimately go was laid. From here on, the ranks of the disaffected would grow, as well as the aggressive reaction of the audience. Nevertheless, to the disgust of many, “Alegria, alegria” came fourth in the contest and “Domingo no parque” second. A year later, the new and expanding Globo TV network held its Third International Song Festival, in September and October of 1968. The Tropicalist impulse was at full force in the minds and productions of Gil and Caetano. Both of them registered for the festival contest, though not particularly bothered about winning. Their intention was to question the structure of the festival itself and the reigning cultural atmosphere. At the TV Globo festival, both took Tropicalist irony and criticism to the limits. Gil presented “Questão de Ordem” (“Question of Order”), backed by the Beat Boys. He was roundly booed and disqualified from the competition. The guitars, his afro hairdo and his singing style did nothing to win over the audience. Caetano presented “É proibido proibir” (“It’s forbidden to forbid”). The song was in practice an excuse for him to exhibit a posture of open rupture with the “good taste” demanded by the cultural ideologies of both left and right. But the performance, together with the Mutantes, was a veritable musical happening orchestrated by Rogério Duprat. Caetano endlessly repeated the French slogan: “It’s forbidden to forbid”, while an American hippie howled into the microphone. In November, 1968, TV Record held its Fourth Festival of Brazilian Music, but without the heated debate of previous years. Tom Zé presented his song “São São Paulo, meu amor” (“São São Paulo, my love”), and won first place. The Mutantes entered with “2001”, a song by Tom Zé and Rita Lee, which came fourth. 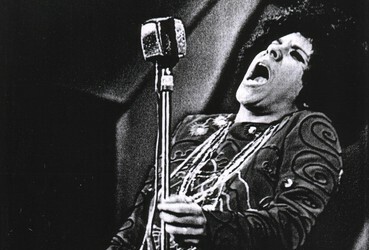 The big revelation of this festival, however, was Gal Costa, who competed with “Divino, maravilhoso” (“Divine, marvelous”) by Caetano Veloso and Gilberto Gil. An aggressive and piercing delivery revealed a sea change in the singer’s career: until then she had been known as Gracinha (Sweetness). The song came third. The Fourth TV Record Festival, even with the aftereffects of the TV Globo Festival, left the Tropicalists with a positive balance.